Restricted Countries Afghanistan, Algeria, Angola, Bahrain, Belgium, China, Cuba, Denmark, Estonia, Eritrea, Ethiopia, France, Hong Kong, Hungary, Indonesia, Jordan, Iran, Iraq, Italy, Kuwait, Libya, Malaysia, Mauritania, Mauritius, Morocco, Norfolk Island, N. Korea, Oman, Portugal, Pakistan, Qatar, Rwanda, Saudi Arabia, Sudan, Somalia, South Sudan, Spain, Syria, Turkey, Tunisia, UAE, the United Kingdom, Yemen, United States and its dependencies, military bases and territories including but not limited to Am. Samoa, Guam, Marshall Islands, N. Mariana Islands, Puerto Rico, and Virgin Islands. Make Combi Bets on your favourite matches of the Euros and win a piece of €10,000 with Euro 2016 Jackpot! Enjoy all the action of the knock-out phases with Triobet’s Euro 2016 Jackpot! Make the right bets and scoop a share of a whopping €10,000 until the end of the tournament at the online sportsbook. There are two more stages remaining to claim a piece of the €10,000 action with the Euro 2016 Jackpot! Period 4: place a Combi Bet on the results of at least 5 games of the 8 matches in Euro’s Round of 16. This Period runs between June 25-27 and can see you win a cool €2,000 prize! Period 5 is the final stage of the Euro 2016 Jackpot and there’s another €2,000 reward up for grabs with this round – valid between June 30 and July 3. Make a Combi Bet on the quarter-final games of the Euros to win a piece of the Euro 2016 Jackpot! Place Combi Bets on the thrilling games of the Round of 16 to win the €2,000 prize, and then a few days later make additional Combi Bets to collect another €2,000 with the Euro 2016 Jackpot! 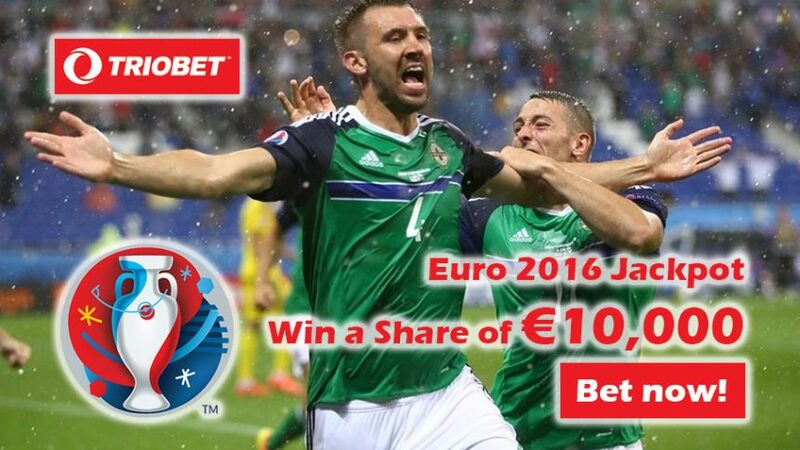 Win a share of €10,000 with Euro 2016 Jackpot!